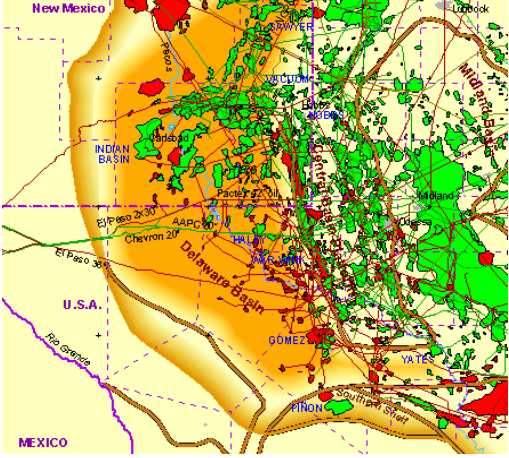 The Barnett-Woodford shale gas play is located in the Permian Basin in West Texas and has an area of approximately 2,691 square miles combined from net acreage and a well spacing of 160 acres per well (4 wells per square mile). 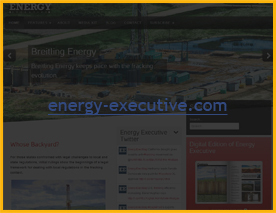 The shale gas play has an average EUR of 3.0 BCF per well and approximately 32.2 TCF of technically recoverable gas. The shale ranges from 5,100 to 15,300 feet deep and 4 to 800 feet thick. Other average properties were estimated for the Barnett-Woodford shale play. 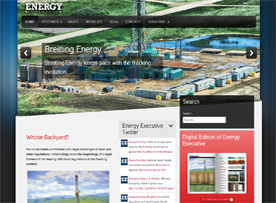 These include the depth (10,200 ft.), thickness (400ft), and total organic content (5.5%) for the shale. In 2008, there were 8 companies holding leases in the Barnett-Woodford Shale. Based upon these lease holdings, the total active area is calculated at 1,722,500 net acres (2,691 square miles). According to Deutsche Bank in 2008, Barnett-Woodford has an average well cost of $6.5 million dollars.